Unlike oil spill contingency plans that typically address spill cleanup measures after a spill has occurred, SPCC plans ensure that facilities put in place containment and other countermeasures that would prevent oil spills that could reach navigable waters. Under EPA’s Oil Pollution Prevention regulation, facilities must detail and implement spill prevention and control measures in their SPCC Plans. A spill contingency plan is required as part of the SPCC Plan if a facility is unable to provide secondary containment (e.g., berms surrounding the oil storage tank). In short, the plan must describe how you intend to operate your facility to prevent spills and what you will do to deal with them if they occur. 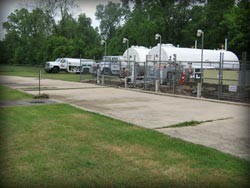 Does Your Facility Need A Spill Control & Countermeasures Plan? Have an aggregate storage capacity greater than 1,320 gallons or a completely buried storage capacity greater than 42,000 gallons; and could reasonably be expected to discharge oil or hazardous chemicals in harmful quantities into navigable waters of the United States. The regulation requires each owner or operator of a regulated facility to prepare an SPCC Plan. The Plan is required to address the facility’s design, operation, and maintenance procedures established to prevent spills from occurring, as well as countermeasures to control, contain, clean up, and mitigate the effects of an oil spill that could affect navigable waters. What Does the SPCC Plan Include? · A facility which has experienced one or more spill events within twelve months prior to the effective date of this part should include a written description of each such spill, corrective action taken, and plans for preventing recurrence (40 CFR 112.7(a)). · A prediction of the direction, rate of flow, and total quantity of oil that could be discharged where experience indicates a potential for equipment failure. · A description of containment and/or diversionary structures or equipment to prevent discharged oil from reaching navigable waters. (For on-shore facilities, one of the following should be used as a minimum: dikes, berms, or retaining walls; curbing; culverts, gutters, or other drainage systems; weirs, booms, or other barriers; spill diversion ponds; retention ponds; sorbent materials.) Where appropriate, a demonstration that containment and/or diversionary structures or equipment are not practical and a strong oil spill contingency plan and a written commitment of manpower, equipment, and materials to quickly control and remove spilled oil. · A complete discussion of the spill prevention and control measures applicable to the facility and/or its operations.